Apart from the ferry from Istanbul to Bursa at the start, and the train from Anakara to Istanbul at the end, pretty much our whole loop around Western Turkey was done using buses. All the towns and cities we visited had one big bus station (otogar) for intercity buses. This is convenient for long-distance travel, but often means there's an extra trip to get into or out of the city centre — in the large cities, this can be quite a long way. We only booked in advance when it was convenient, but had no problems (except with the ferry from Istanbul to Bandirma, but that may have been something to do with it being a public holiday). And we never had trouble finding the right bus, though in the bigger bus stations with lots of different bus companies there's often a choice of departure times. People were always very helpful. The intercity buses we travelled on were all in good condition — mostly modern Mercedes — with comfortable seats with adequate leg room, enough room under the seat for my small backpack, and air-conditioning. (And none of them overdid the air-conditioning, instead maintaining quite reasonable temperatures.) On any long trip, drinks and a small snack were provided, often with hand cleaning spray or wipes, and there were stops for lunch where appropriate. Given the distances involved, the prices were very reasonable. 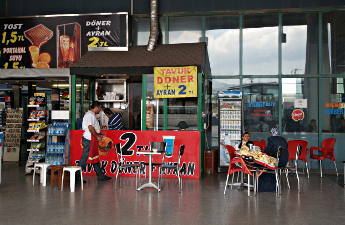 The nearly 300km trip from Goreme to Ankara, for example, was only 25 lira, while Bursa to Izmir was 20 lira. The buses mostly leave on time, to the minute, and services are often coordinated. So if you get to a bus station and there's an obvious "next hop" — say from the ferry port to the bus station in Bursa, or from the bus station into town in Beysehir — then be alert, since the bus you want may be leaving shortly! 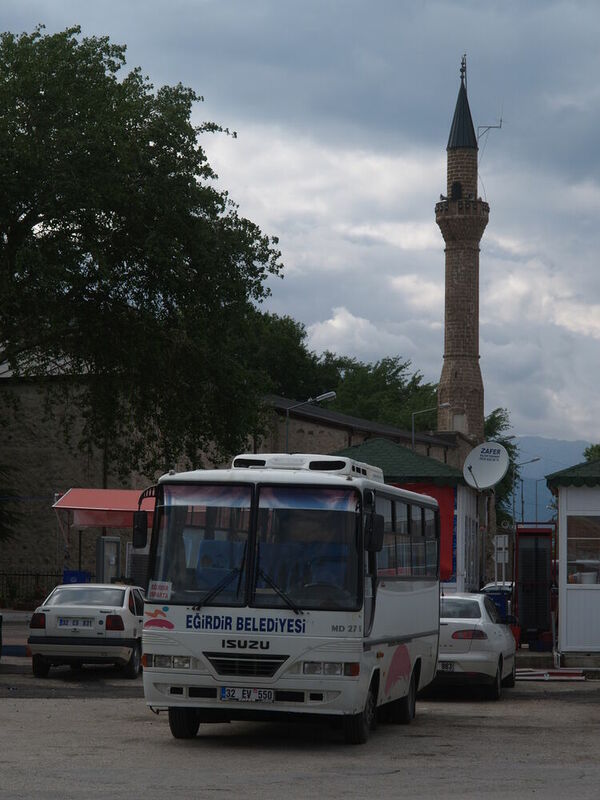 Getting around inside towns, and out of town to the bus station or smaller destinations — Konya to Selle, for example, or Isparta to Egirdir — is a bit more complicated because you have to know where to find the bus you want. We had thought about a plane flight from the Aegean coast to Cappadocia, but there was no direct flight from Izmir to Konya or Kayseri. We ran into one couple who had hired a car, two groups who had hired a car with a driver/guide, a couple planning a motorcycle tour, and lots of backpackers. If you have more money and less time and are prepared to keep moving, a personalised tour package with your own driver/guide might be the way to go. We also met backpackers who were using overnight bus trips to save money and maximise the time they had. Western Turkey is well set up for all kinds of travellers.